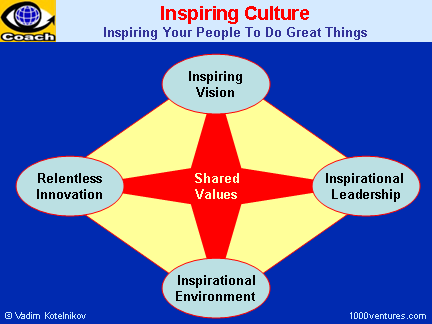 If yes, then you must create an inspiring corporate culture to inspire, empower and energize them. Employees who have a sense of ownership are more motivated than those who feel that they just work here. Individual employees and teams thrive when they have a sense of ownership. The more empowered and engaged people are, the more committed they are to the company and try to do their best. Inspirational leaders create an inspiring culture within their organization. People are not led by plans and evaluations. If you want to move and get the best from your people, don't say "I have a strategic plan". You must create inspiration, self-respect, a sense of ownership and excitement. Inspirational leaders breathe life, confidence and creativity into the organization. They supply a shared vision and inspire people to achieve more than they may ever have dreamed possible. People change when they are emotionally engaged and committed. Inspirational leaders create 'can-do' attitude and make business fun. Burson-Marsteller, a world's largest public relations agency, created a company called "SynerGenics" that not only helps a company define its corporate culture but rolls up its sleeves with the company's executives to help them implement an "employee involvement" program. Geoffrey Nightingale, creator of B-M's highly successful Creative Services Department, looked into how to make a company "values-driven." Working with a psychologist/management expert, Nightingale researched the question for two years. He concluded that employees of a values-driven company understand the company's vision and values clearly and feel a "market affiliation." The result is a company where all employees feel "a sense of wholeness." The employees feel that they own the company.